Daffodil Day is one of Australia’s best known and most popular fundraising events. Each day more than 100 Australians will die of cancer. Daffodil Day raises funds for Cancer Council to continue its work in cancer research, providing patient support programs and prevention programs to all Australians. Daffodil Day helps grow hope for better treatments, hope for more survivors, hope for a cure. 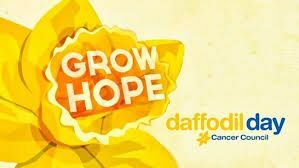 To Cancer Council, the daffodil represents hope for a cancer-free future. You too can help in the fight against cancer by participating in Daffodil Day. Daffodil Day merchandise is on sale throughout August, and you can donate to Daffodil Day at any time.